With a track and design based off of the reliable Indy Pinnacle, the Indy Platform is safe, stable and easy to use with your wheelchair or motorized scooter. Featuring safety features such as ramp obstruction sensors, an over speed governor and non-skid surfaces, the Indy Platform is made to perform. For your convenience the Indy Platform manages to act as a safe transport system without requiring a lot of room. When folded the stair lift sits a slight 12” from the wall. Its platform is a roomy 25” by 36” and automatically folds at entry and exit. The Indy Platform can travel up to 40 feet at a rate of 14 feet per minute. 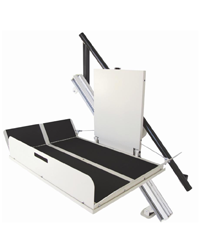 The Indy Platform is also available in an outdoor package.For use with a wheelchair or motorized scooter, the Indy Platform Stair Lift is based on the compact Indy Pinnacle design and has additional features. Much like the Indy Pinnacle, the Indy Platform Stair Lift folds close to the wall. Safety features, on the other hand, are geared toward wheelchairs and motorized scooters: a ramp obstruction sensor, non-skid surface, and an over speed governor. Designed with an auto-folding feature, this platform stairlift folds at entry and exit points. Each Indy Platform can travel up to 40 feet at 14 feet per second and has a 25 by 36-inch base, and its wall-mounted guiderail doubles as a handrail to provide the user with better stability. An outdoor model is also available. Auto-folding feature for ramps on both ends of the platform. Is also offered as an outdoor package. Offers convenient wall-mounted guide rail that also provides stability as a handrail. Uses the same track as the reliable and popular Indy Pinnacle. Sits a mere 12″ from the wall when folded. Controls Constant pressure rocker switch on platform. Radio frequency with wireless key fobs. Safety Features: Over speed governor, upper and lower landing limits, ramp obstruction sensors, under platform safety pan, drive chassis obstruction sensors, and non-skid surface.